I recently had the chance to purchase some of the Layla Magneffects line at AveYou.com during a SaveMore sale (I got $75 worth of stuff for $35, and with an order of $50 or more, you get $1 shipping... all in all I payed only $38.50 for these five, and they normally retail for $15.50 each!). I am SO glad I decided to try these out! They are AWESOME! The pictures below show one thick coat on index and ring fingers, and two thick coats on middle and pinky. I'm pretty sure this is my favorite one. 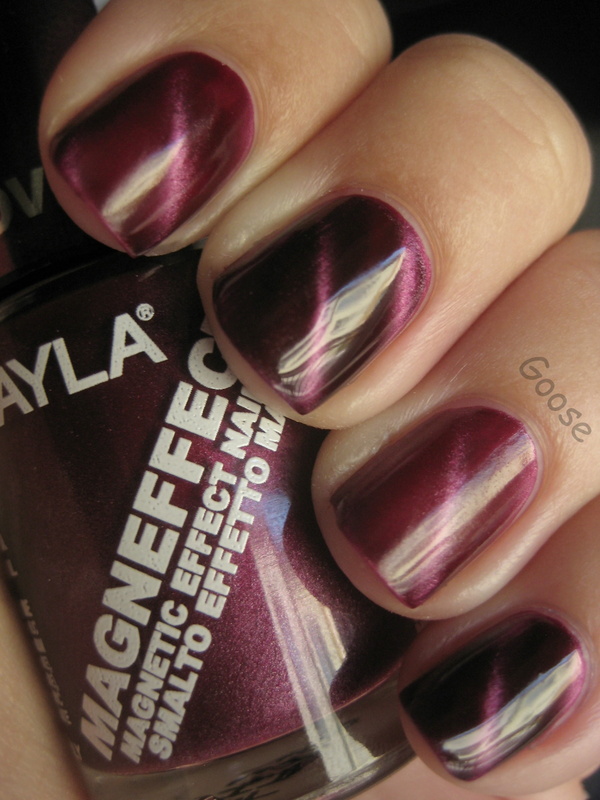 At two coats it truly looks like soft burgundy velvet... LOVE. 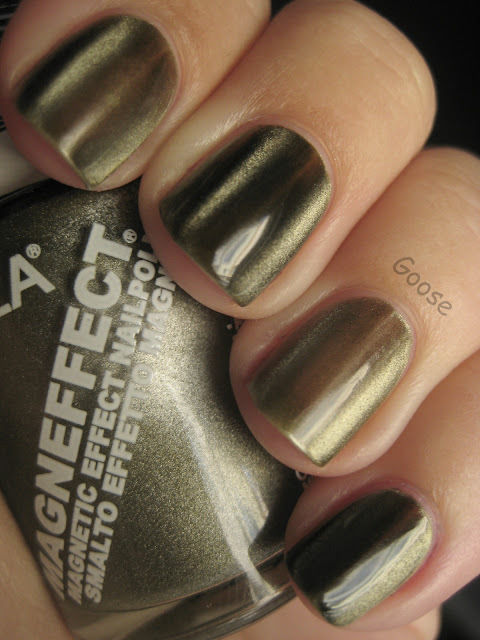 This was a color that at first I thought "Ewwww, that doesn't look attractive." Somehow I changed my mind and it ended up in my order, and I'm glad it did! For this one I lined up the magnet vertically with my nails, and it's hard to see in the picture but it really makes them look VERY 3D and awesome. 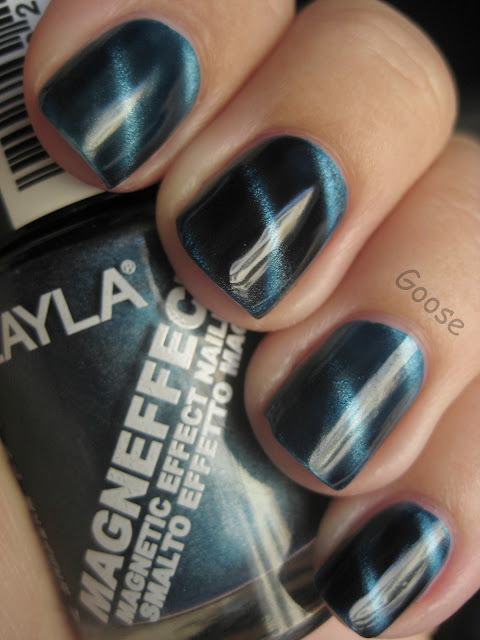 Although I like the diagonal stripes, I think this is my favorite orientation - it even makes my short nails look long and pretty in person. It's hard to capture the 3D effect in a still photo, but trust me: try this at home!! Another neat color. 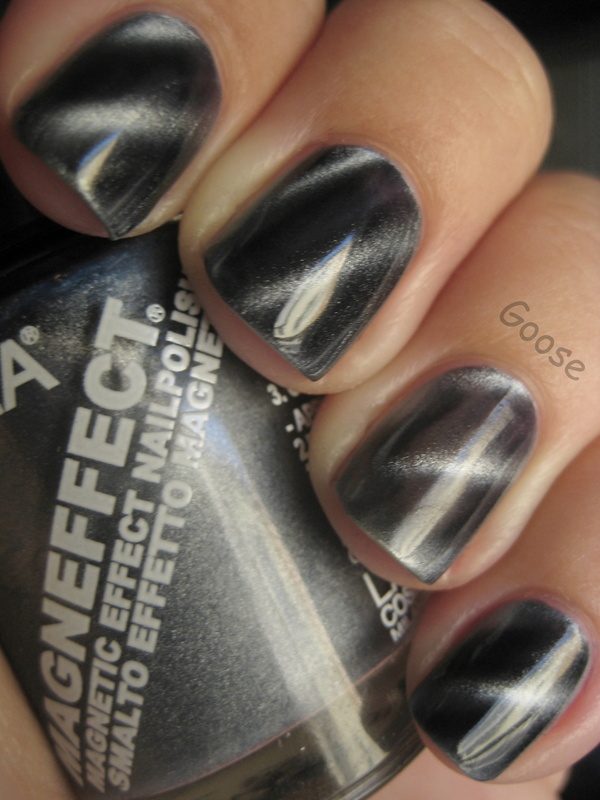 The metal parts end up looking silver and the spaces in between become a navy blue. 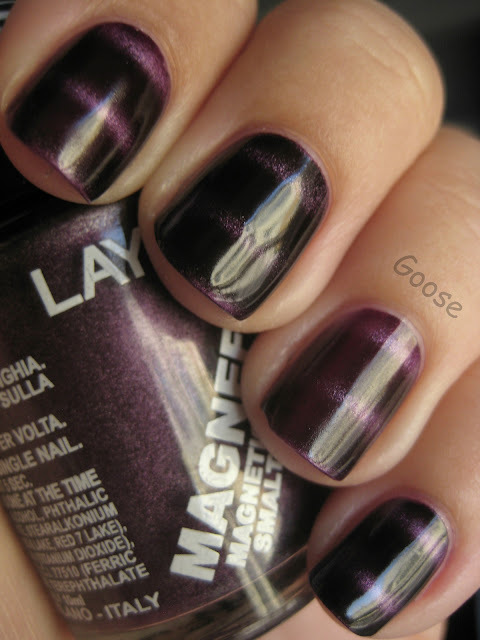 The first coat of this looks like a nice rich purple, and with two coats it becomes a vampy dark plum with metallic accents. Very classy, in my opinion! And my third favorite of the bunch. The brightest one of all, and just stunning in person. Disappointing, no? Oh well, at least I'm not gonna worry about combining them with holo pigment anymore. However, I still think that if they could somehow make a magentic pigment that is also duochromatic, this could produce one of the most epic polishes in the WORLD! These are some of the best swatches. I wish I would have known Metallic Sky and Velvet Groove were so gorgeous before I placed my order.